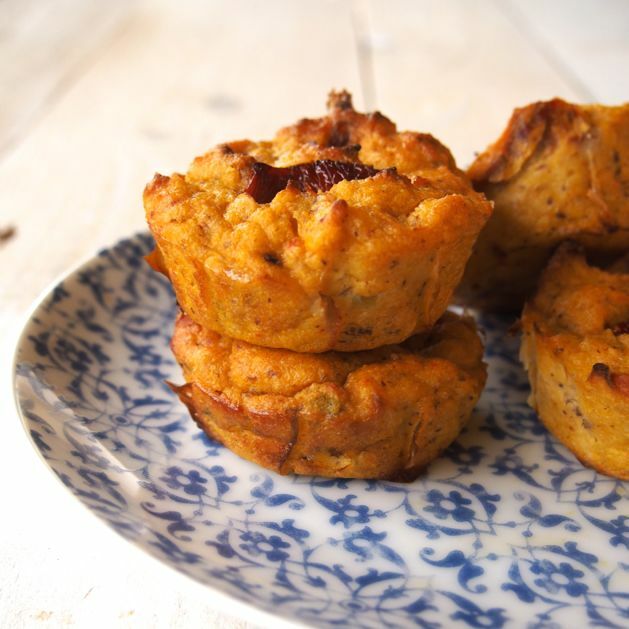 Paleo Pumpkin & Sundried Tomato Savoury Muffins. It is no secret that we LOVE recipes that are quick, easy and delish. It is also no secret that we love savoury muffins. 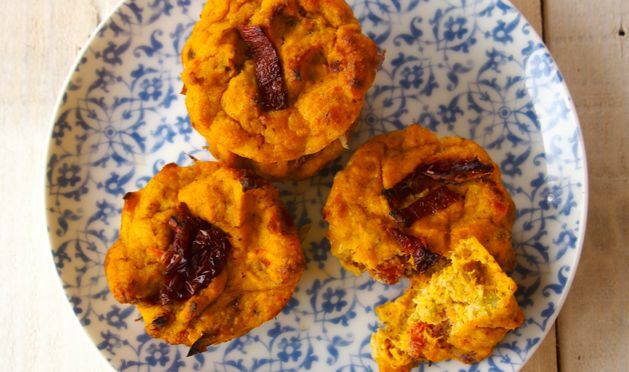 Paleo pumpkin and sundried tomato savoury muffins to be exact. The best thing about this recipe is that if sundried tomatoes aren’t your thing (seriously… how is that possible? They are so yum) you can just swap them for something else! Think basil, bacon, capsicum, eggplant, cashews, cheese! What ever floats your savoury muffin boat! We used ghee in this recipe… which is clarified butter. Basically it’s amazing because it tastes ridiculously cheesey like, minus the lactose and casein (as that’s removed in the process!). This is perfect for us because Carla can’t do dairy (even though she does sometimes! Hehe). The amazing guys at Primal Collective hooked us up with our ghee… and it’s by far our fave ghee we’ve ever tasted. These muffins are the perfect little snack to pack in your lunch box for afternoon tea! We also discussed how YUM these muffins would be for dinner, like as a side, like a bread roll almost! Imagine dipping it in soup! Or soaking up sauce from our lasagna! Yes, these are the kinds of conversations we have every day. We do have alotta fun! Afterall… that is one of our #10MerrySteps! 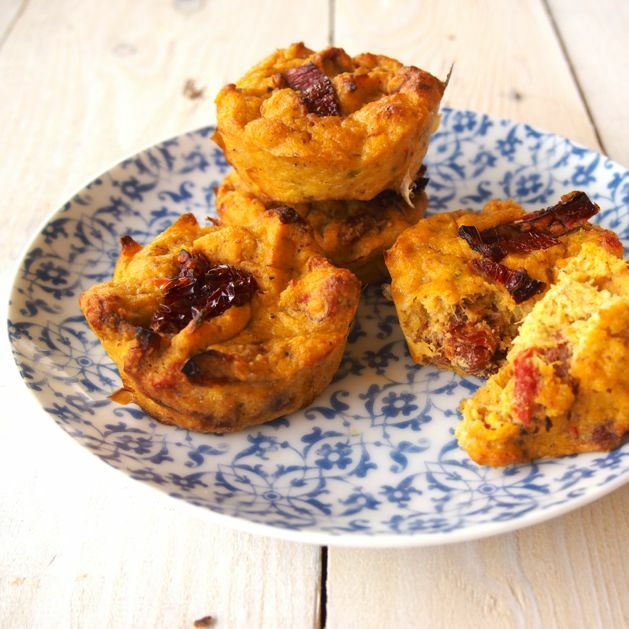 Have you already popped paleo pumpkin and sundried tomato savoury muffins on your ‘to bake’ list? Yes?! Good! Well you better get to it… because that list is getting long and life calls for these muffins to be in your life STAT! p.s our Make Life Merry Challenge starts NEXT WEEK! Arrh! We are SO excited! If you need a little extra motivation to kick start your health journey… then come and join us! Preheat oven to 180°C (350°F) and line muffin trays with baking paper or grease the sides with coconut oil. In a blender/food processor blend the pumpkin, almond meal, ghee, eggs and salt until smooth. Add the shallots and sundried tomatoes, mix well with a spoon until just combined. Fill 8 muffin trays with the batter and place in to the oven for 40 minutes. Allow to sit for 10 minutes before enjoying warm with a dollop of butter... or store them in the fridge for grab n go snacks! Don't like sundried tomatoes (say whaaaat?!) you can swap for something else... think spinach or mushrooms! Uhh YUM!